For those who want more versatility and added value in their ride. Some of its features include Tri-mode Dynamic Power Steering (DPS), a 3,000-lb winch, and heavy-duty front and rear bumpers. Rotax® V-Twin engine options: Available with a 46-hp Rotax 500, 62-hp Rotax 650, 71-hp Rotax 800R or 82-hp Rotax 1000 liquid-cooled V-Twin engines with four valves per cylinder and overhead camshafts. With twin fuel injectors that supply efficient fuel delivery into the combustion chamber for powerful, yet precise performance. Continuously Variable Transmission (CVT) with engine braking: For ease of use, you can count on the CVT transmission that features engine braking to help slow you when going downhill. Large 5.4 gal (20.5 L) fuel tank: 25 percent more fuel capacity, which means you can ride longer. Total capacity is 5.4 gallons (20.5 L). Redesigned air box: The new air box was reconfigured and placed at a higher and more centralized location for filtering and processing air. The no-tools air box features a dual-room design that improves the air filtration process and the quality of air by capturing dirty air in one portion of the box and clean air in another section before it sends the air to the engine. Along with the relocated air box the air intake is also higher in the frame to improve the machine’s capabilities in the mud and water. Large radiator with increased cooling capacity: The larger, more efficient radiator offers almost double the cooling capacity and keeps the engine running cool for optimal Industry-leading performance. The radiator capacity grew by 14 kW with the engineering updates. Torsional Trailing arm Independent (TTI) rear suspension: The only independent rear suspension that eliminates scrub and camber changes, meaning the wheels pivot up and down rather than in a butterfly motion like competitors' systems. This ensures the vehicle only moves in the direction you point it. With fewer moving parts than competitive systems. The proven Torsional Trailing arm Independent (TTI) rear suspension has been reconfigured to offer increased rigidity and improved suspension travel. The updates lead to lower pivot points providing geometric squatting for improved traction and the transfer of power to the ground. Double A-arm with dive-control geometry: Includes dive-control geometry for better cornering and vehicle-braking dynamics and anti-kickback geometry for better steering feel. The 9 inches of suspension travel increase trail comfort and aggressive riding capability. Surrounding Spar Technology (SST G2) frame with Geometric Contact Control: The next generation and industry-exclusive Surrounding Spar Technology (SST G2) frame. The welded-steel frame incorporates new processes and updated geometry for increased structural integrity, improved durability and precision Precision-engineered handling. The more efficient SST G2 design offers increased strength compared to a traditional tubular steel chassis, a lower center of gravity, better Precision-engineered handling and requires far fewer components, materials and welds. 214-mm ventilated disc brakes with hydraulic twin-piston calipers: The front and rear setup use large 214-mm disc brakes with twin-piston calipers for superior stopping power. Multi-function digital gauge: Tells the rider everything in one easy glance. Our easy-to-read multi-function gauge is equipped with a digital information center including a speedometer, tachometer (bar graph RPM, bottom bar numerical), odometer, trip meter, gear position, hour meter, engine hour meter, temperature and engine lights, fuel gauge and a clock function. Center skid plate: The high-strength skid plate is made from proven materials and is designed for supreme protection and has the ability to slide over certain obstacles. Made of 5-mm thick injection-molded high-density polyethylene (HDPE). High-strength, multi-function racks with LinQ quick-attach accessory system: The Outlander ATVs have redesigned cargo racks offering more convenience, greater durability, improved versatility and industry-leading cargo hauling prowess. High-strength, reinforced composite racks replace the tubular steel setup. The innovative racks feature an integrated anti-skid surface and elevated ridges for improved cargo holding. Numerous edges and holes improve use with tie-downs and bungee cords. Additional predetermined “cutouts” were also added for use with Can-Am’s exclusive LinQ accessory system, which is adaptable and customizable for various uses and products. LinQ accessories are already available from Can-Am dealers. Combined rack capacity is 300-lb (100-lb front / 200-lb rear). Easy access for maintenance: Can-Am engineers succeeded at producing a more maintenance-friendly setup. The battery was relocated beneath the seat to offer easier access and improved protection. The rear brake fluid reservoir, solenoid starter and relays were also placed under the seat. 1,300-lb (590 kg) towing capacity: The Outlander offers a sizeable, 1,300-pound towing capacity and a new 2-in. receiver hitch as standard equipment. 5.7-gal (21.4L) water-resistant rear storage box: A huge 5.7-gallon (21.4L) rear storage box offers industry-leading cargo capacity and is located beneath the rear cargo rack. The more convenient location means riders can access the water-resistant, sealed storage box even when the rear cargo rack is loaded. 230-W headlights. 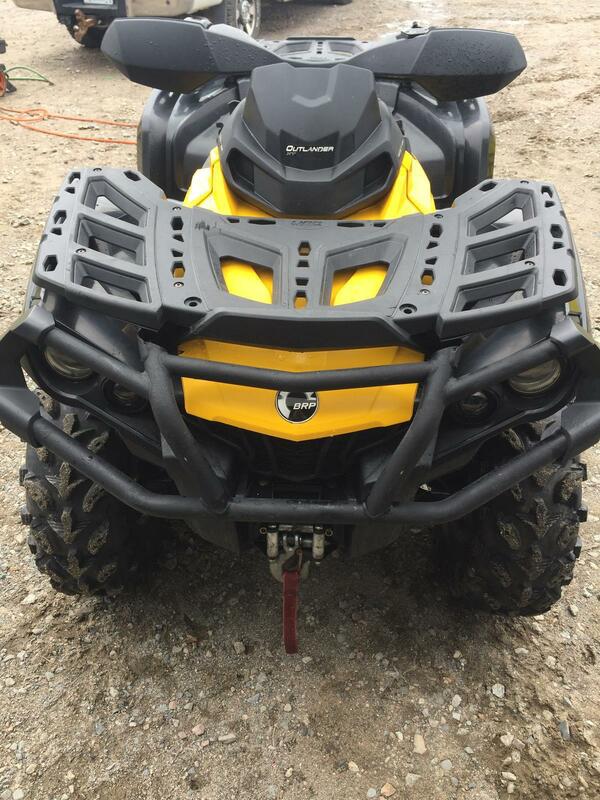 The most lightning output of any ATV in the industry: Restyled headlights project Can-Am heritage and also offer enhanced visibility for trail riding. On high beam, the twin 60-W projectors and dual 55-W reflectors give the Outlander 230 -W of visual clarity. Digitally Encoded Security System (D.E.S.S.™): Outlander models feature the exclusive D.E.S.S.™ anti-theft system. The ATV will not start unless a coded microchip in the key matches a code embedded in the engine control module. It means only you can start your vehicle. Dual taillights: The Outlander taillights offer a stylish design and increased visibility for trail riding. 3,000-lb WARN® winch with roller fairlead, wired remote control & integrated remote storage: This powerful 3,000-lb (1,361 kg) capacity factory-installed winch is equipped with a wired remote control that neatly stows in the underside of the ATV's front storage compartment cover. Visco-Lok® QE auto-locking front differential: All DPS-equipped models have the Visco-Lok® QE calibration up front, which has all the features and benefits of the standard quick-engagement Visco-Lok® differential, but with an even quicker engagement point. This differential, unlike some competitors' differentials, does not have a speed limiter. Handlebar wind deflectors: Premium look and protection from brush and cold. 12-in. cast-aluminum wheels with machined finish: The center-less design reduces unsprung weight and offers improved strength. Durability was increased in strategic areas while excess material was eliminated in other spots to save weight. Tri-mode Dynamic Power Steering (DPS™): The Tri-Mode DPS™ features three rider-selectable modes (MIN, MED and MAX) of steering depending on rider preference. The system is designed to offer less assist at high speed and more assist at low speed. This technology also includes a Direct Link setup that uses advanced magnetic field sensors for faster response to steering input than competitive technology, which then minimizes steering lag. Less kickback and more trail feedback is supplied to the operator because of the 50:1 final gear ratio, which is the largest in the industry. A high-capacity 50-amp motor means the DPS™ will never fade with heavy use and all DPS™-equipped models also come with the Visco-Lok® QE. 26-in. Carlisle® ACT tires: These 26-in., 3-ply tires feature a tread pattern that is aggressive enough to tackle the toughest terrain, yet provide a smooth ride in a lightweight package. 625-W magneto: This package provides a more powerful magneto with 625-W of power output.